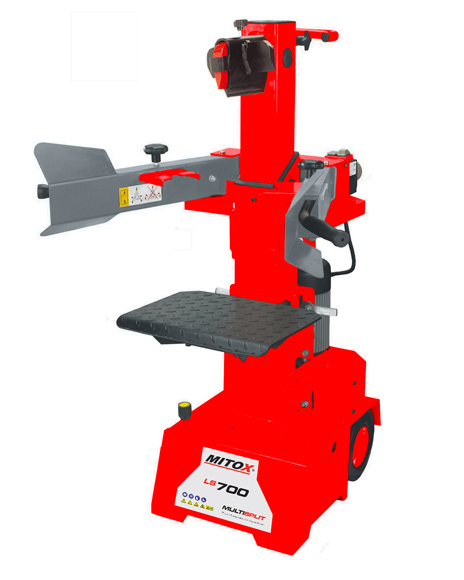 The Mitox LS700 vertical log splitter has a 3000 watt mains electric motor which produced a splitting force of 7 tonnes and is the most powerful electric machine in the Mitox range. This machine is mobile with large grip handles and transport wheels. Logs of up to 106cm/42.4 inches long and 32cm/12.8 inches in diameter can be split in seconds. Toothed grippers firmly hold the log in place. Then simply depress the two control switches and the reinforced pushblock drives the log into the fixed multisplit four way splitting wedge saving time compared to having to split the same log more than once. When working with shorter logs, Mitox’s Quicksplit adjustment allows the pushblock starting position to be changed so the machine will work at a faster stroke. The splitting table can also be adjusted through three positions to suit the size of wood to be split. A 5 metre long mains cable is standard, and gives flexibility finding the best working position even is this isn’t right next to the power outlet.